The day has come, it’s finally here! We’ve launched a brand new site with a new design and a ton of new features. I previewed our new site before, but now that we’ve gone live, here’s your virtual tour of the new features. Who doesn’t like quotes? We’ve collected over 1000 quotes (so far) from the geeky books we’ve read. Our homepage will regularly update the quote. Check the timer to see how long until the next one is posted and come back to see the next one. We love our Geeky Book authors! 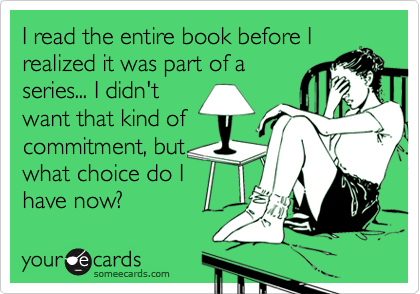 Authors write the books and we review them. We appreciate all their hard work, so now book authors have their own page, now with links to twitter, their personal website, and wikipedia that list all of the book we’ve reviewed. A perfect example of this is the page for popular science author Mary Roach. 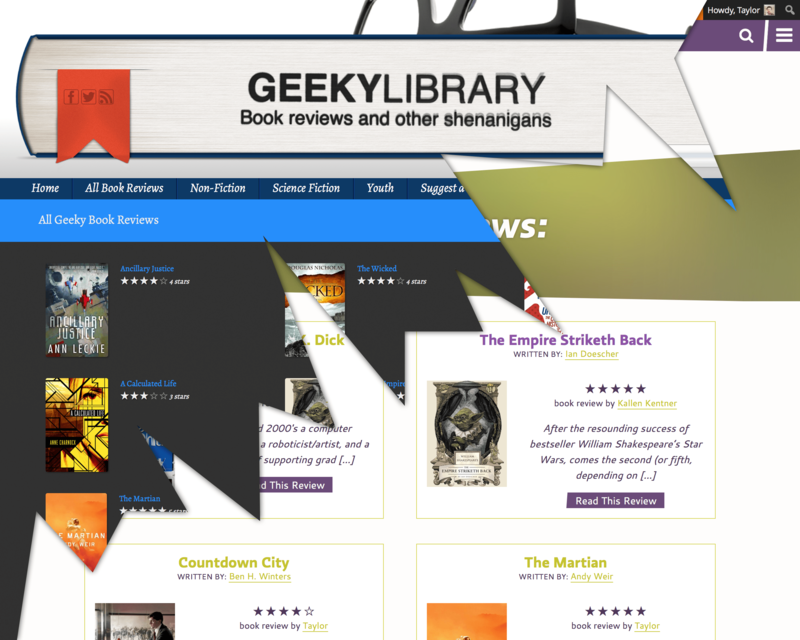 We’ve also given publishers more visibility, featuring their logo next to a book review. If clicked, it will direct to an archive featuring all the books we’ve reviewed from that publisher. You can see this in action on our review for The Empire Striketh Back, published by Quirk Books. We’ve reworked our front page so we can feature selected content from the site. Instead of the site automatically showing our most recent review, we can curate a selection of items for our readers. The most graphic books published right now are the comic books, so we took a lot of graphic inspiration from them. The angles of our grid are based on comic layouts and a blog post by Jenni Chasteen on Inspired Mag. When we developed our style tiles, all the colors were geekily named and you may catch a glimpse of the half-tone pattern. We’ve even changed our logo, although we kept the glasses sitting on top of the book. Fun fact: The founders of geekylibrary all wear prescription glasses. And we’re too lazy to put in contacts. Even geekier fact? The main vertical angles on the site are a 4.2° slant left or right. Because 42 is the answer. 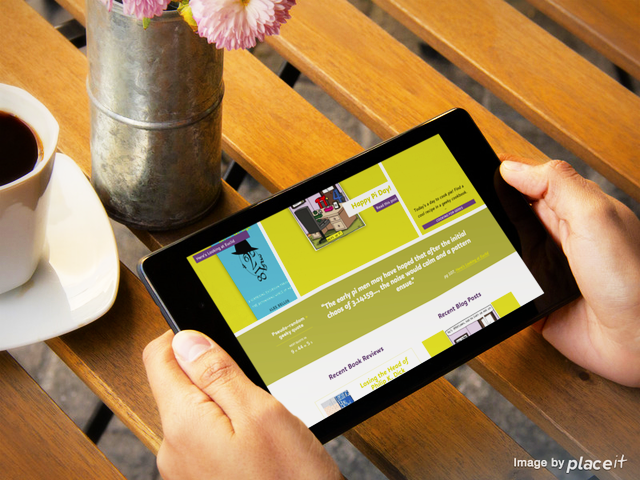 We’ve redesigned our mobile experience with a focus on readable content, without large images getting in the way. Now our readers can check out the latest reviews on their favorite mobile platform. I don’t know about you, but I do at least half of my internet reading on my iPhone. We will continue to enhance mobile browsing in the future as well. We’ve all been there, so now we’re adding series information to GeekyLibrary. If the book is part of a series, that information will be displayed at the end of a review. By the way, The Lives of Tao is the beginning of a series. That nonfiction book with the really long subtitles? In an effort to reflect the growing trend of non-fiction books with really long subtitles, we’ve added subtitle capability. You can see this in action with The Disappearing Spoon. Have you read Ready Player One? Totally geeky and filled with 80’s game culture references. But what should you read next? We’ve linked it to You, by Austin Grossman, another book featuring 80’s gamer references. When we think books relate to other geeky books, we can link them. Although we hope this will help readers discover new books, half the fun may be trying to figure out why we’ve linked the books. There are other tweaks, features and new content on our site, but discovery is half the fun. Enjoy! You are welcome to leave us feedback.